Yesterday I was having a no-good, rotten, very bad day. - It was a bad hair day. - We're out of coffee creamer. - I ran at least an hour behind schedule all day. - I had an ingrown toenail. - I needed to go to a specific bookstore in Wichita. It was closed down. - I needed to go to the phone store in Wichita. I forgot the gift card and cell phone at home. - Hormones. So multiply the (perceived) severity of each of these items, by about 25. - I did go to Target, came out and found this. 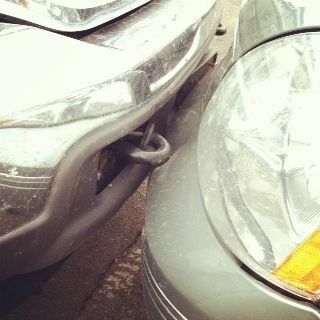 A truck had pulled nose to nose with my car, but didn't stop. The one getting crunched is mine. - A scoop of ice cream works. - There was no tight time frame other than the one in my head. I wasn't late to anything. - I had cute boots to cover the ingrown toenail. - There are other bookstores. Or I can buy online. - The Man and I will just take another trip to Wichita to go to the phone store. - I walked into Target wearing cute boots. I walked out with an additional pair of cute boots. Called the police about the fender bender, the other drivers left without acknowledging anything but I have a picture of their license plate. 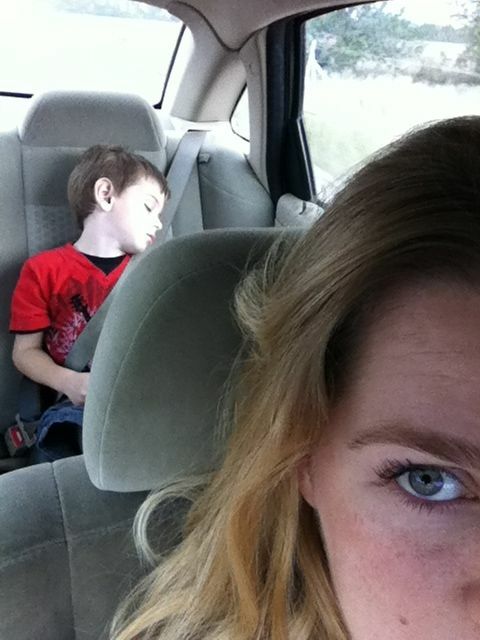 - The Baby slept all the way home. So it was just me, my hormones, and God... who managed to kick the grumpiness out of me. Today was See You At The Pole. If you're not familiar, it's an annual gathering of students all across America, and the world. They meet at the flag pole at their school for student led prayer. I got teary just snapping this pic on my phone! It's a really beautiful thing. So I had to get up early to take my big kids to that, since the bus wouldn't get them there on time. I was to take them there, then take The Baby to the donut shop and spend a few minutes with him before dropping him off at his school. But before I was even awake The Man called me and told me it was "Donuts with Mom" at The Baby's school. If I were just going to the donut shop, I'd have worn jeans, a t-shirt, and boots. Easy peasy. But the school?? That's a different story in our town. I've seen women at "Donuts with Mom" dripping with jewelry, wearing heels. For real. These women mean business. So I had to actually put on real clothes, brush my hair, even put a little makeup on. We showed up at The Baby's school and it was dark. Both outside and in. But there were moms, kids, and staff everywhere inside. We just couldn't see anyone's faces. We were directed to one room. There were no donuts. And no other moms. I asked about it, and we were directed to the cafeteria. And in the cafeteria, there were no donuts. And no other moms. I asked again, and we were directed to a third room. Donuts! And moms. Although I couldn't really see who anyone was. I'm pretty sure they all had on heels and loads of jewelry though. It stormed all night, rained all morning, I've sneezed at least 372 times today, and my head is in a fog. It's just been a weird few days. The prayer meeting gets me teared up every year when I hear about it on K-Love. Love that. And our school is the same way with moms dressed to the hilt simply to take their kids to school. What the heck is up with that? We were supposed to have doughnuts and books this morning at school but I pretended like I didn't know because I didn't want to get up and get fancy. Ice cream in coffee is brilliant. That was fun to read. :) I know you looked great that day too, even though no one could see each other in the dark room. Ha! Love this post! 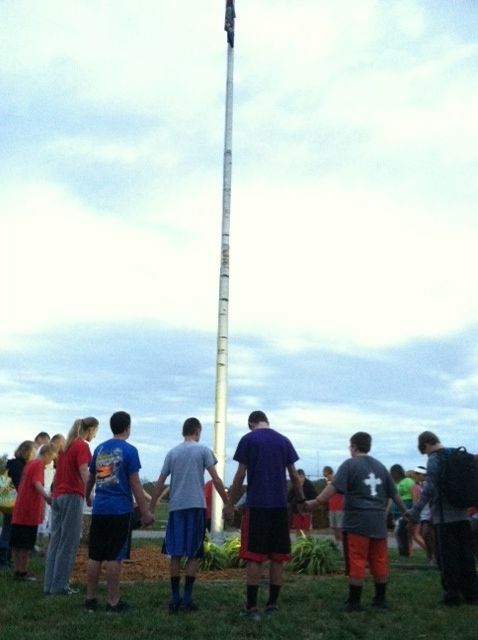 And the "'See You At the Pole' photo is beautiful. Wish I'd have had my phone with when I took our kids, too. this post cracks me up! I am sure it wasn't funny at the time! Here's to a better day tomorrow! good that you can keep perspective & a sense of humor through it all... and cute boots - sweet!